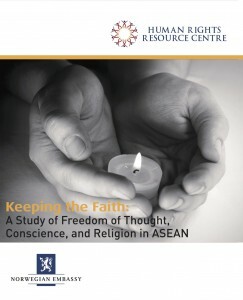 On January 2015, the Human Rights Resource Centre published “Keeping the Faith: A Study of Freedom of Thought, Conscience, and Religion in ASEAN.” The Cambodia, Indonesia, Myanmar, and Thailand country reports have been translated to Khmer, Bahasa Indonesia, Burmese, and Thai, respectively. The original report and the translations can be downloaded below. All, ASEAN, Brunei, Cambodia, Indonesia, Lao PDR, Malaysia, Myanmar, Philippines, Singapore, Thailand, Vietnam, Vulnerable Groups. permalink.